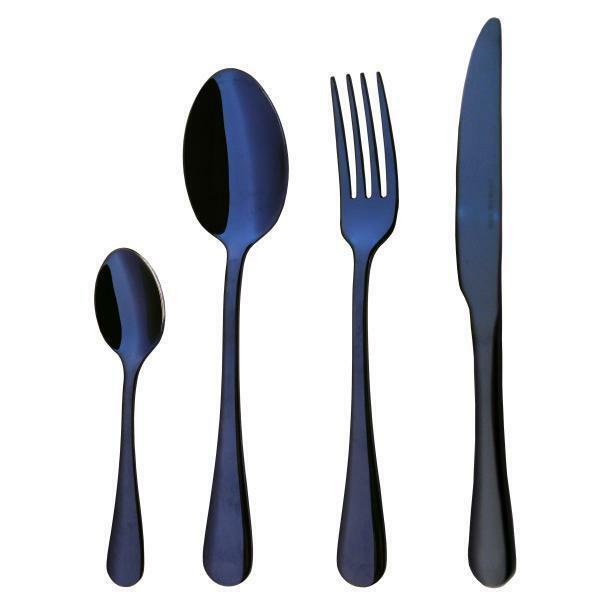 Cutlery Flatware Set | PVD Blue | KEJ-454BL(KEJ-454BL) - Keywood International Inc. This cutlery set has the simple and oval taper design for a clean look. The knives undergone special hardening process to produce a sharp cutting experience. It is PVD blue finish and made from high-quality stainless steel. Available in 16-piece, 20-piece, 24-piece set, 30-piece cutlery set or more. Set composition can be customized to suit your need whether it's for large catering or family use. Timeless, elegant design with blue coloring for fine lustre. Made of high quality food-grade stainless steel for safe use.